Genre-blurring experimental heavy band Wreck & Reference have announced their 2013 Summer tour. The California duo consists of a drummer and a vocalist who plays Ableton Live samples on an drum pad controller, so their guitar-less live dates should be an interesting show to catch. Their official debut "No Youth" was Idol Threat's Best Free Album of 2012. 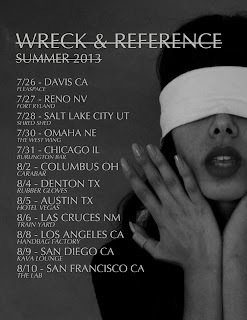 Wreck & Reference will be playing at The Burlington Bar in Chicago on 7/31. The band’s new 7″ EP No Content is now available through Flenser Records, and you can download it for free on their bandcamp. Check the dates in the flyer above or you can see them all after the jump.